Planning, the cornerstone of SolutionMUS, includes two key components: participatory assessments and flexible design. Integrated, appropriate and sustainable water services that meet demands for domestic and priority productive water uses. Complementary health, livelihood and environmental programs that address poverty issues and promote sustainable services. Conduct a participatory assessment to understand current and future water demand and supply for all purposes. Use your assessment to design appropriate technology and management approaches for sustainable Multiple-Use Water Services. Water Demand: Assess the full range of people’s current and projected water needs – including the quantity, quality and location of needed water services consistent with each intended use. Water Supply: Identify current water services and infrastructure, including existing condition and services gaps. Determine what natural water resources are available that could be developed – both now and under future climate scenarios. Technology: Work with communities to understand what people want, what the water sources can sustainably provide and the local capacity for long-term management. Employ participatory approaches to ensure that extraction, lifting, storage, distribution and treatment technologies and infrastructure are desirable, feasible and viable. Management: Select the supporting programs (governance, financing, management and training) that ensure long-term sustainability of water services. Use participatory processes that help people choose, plan, and execute effective and sustainable management models. Click to view an example of Water Accounting: A framework for assessing and designing water services based on domestic and productive needs and existing water sources. Learn more about water accounting. Evaluate current hygiene and nutrition practices and gather insights into how to motivate people to adopt healthier behaviors. Use insights gained from the SolutionMUS assessment process to select the most effective health-enhancing activities for the specific context and budget. Hygiene: Assess current practice and barriers to adopting hygiene behaviors that prevent disease. Sanitation: Assess current levels of open defecation and access to sanitation services. Nutrition: Determine food type and availability, dietary practices and current nutritional status, especially of children. 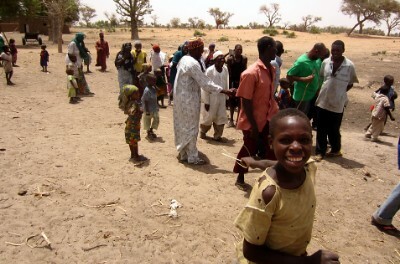 A community in Zinder, Niger completes a transect walk of their neighborhood as part of the Community-Led Total Sanitation (CLTS) initiative. Analyze current livelihoods and the market potential of new income-generating opportunities to guide the strategic diversification and expansion of livelihoods. Add livelihoods programs to deepen income generation, food security and resilience impacts associated with Multiple-Use Water Services. Crops: Document current agricultural production for home consumption and/or for sale and assess the potential to increase productivity and market access for crops. Livestock: Determine the level of livestock holdings and husbandry activities, and explore opportunities to increase the number and health of wealth-producing animals. Enterprise: Evaluate the potential to start or expand small- and medium-sized businesses to diversify incomes and lift rural households out of poverty. 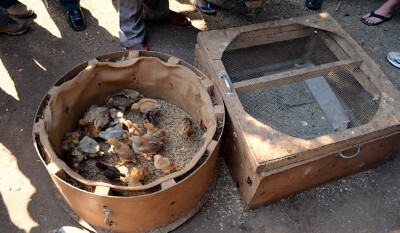 Winrock Tanzania is gearing some of its livelihoods activities towards women by finding light touch ways to improve poultry production, a household-based income generation activity that is currently constrained by high chick-mortality rates. Learn more about the brooder above by watching this video [opens in a new window]. Analyze existing water-related ecosystems and how human activities may impact them, and use this information to design environmentally sustainable and resilient Multiple-Use Water Services and benefit-enhancing activities. Consider complementary environmental support programs to maintain and enhance the health of natural ecosystems, which are key to sustainable water resources, quality of life, and many livelihood activities. Water Resource Management: Analyze the strength of water governance processes and institutions that underpin equitable and sustainable water supplies. Ecosystem Management: Determine the needs of ecosystems and biodiversity for continuous flows of clean water and other environmental services. Waste Management: Understand how solid and liquid waste is currently managed, and identify appropriate, environmentally sound disposal and treatment approaches. 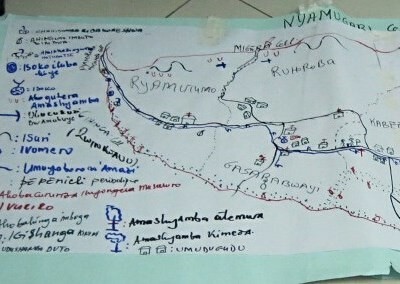 At a planning workshop, residents of the Nyamugali cell, Mwiri sector in Rwanda drew this map representing how actions in one part of a watershed impact downstream users. Create the opportunity to maximize synergies among different components of SolutionMUS by planning holistically. Plan water, health, livelihoods and environment program components holistically, seeking out opportunities for integrated impact across activities. Engage a multi-disciplinary planning team which includes expertise in water, health, livelihoods and environment. Empower clients who have less control and influence in the community throughout the planning process to ensure a range of interests is reflected. When analyzing options, take into account differences in the population that might create conflict or unequal outcomes within and across different benefit-enhancing water, health, livelihoods and environment programs. 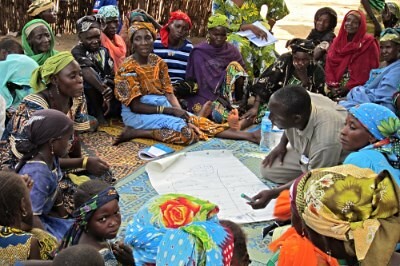 Women are consulted during a Customer Value Chain Analysis for Rope Pump technology in Zinder, Niger.